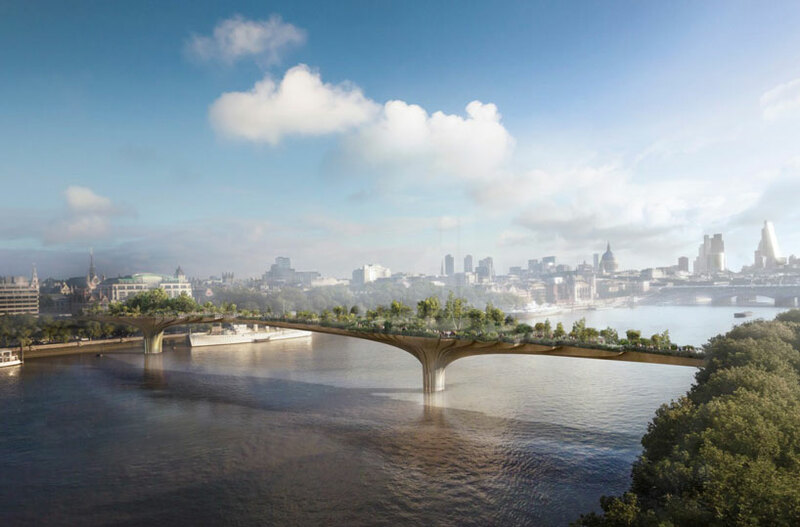 UPDATE: on july 11, 2016, it was reported that london mayor sadiq khan had effectively suspended work on the garden bridge over fears of increasing costs for the tax payer. construction in london was underway, however — according to the architects’ journal — work has now come to a halt and will now undergo further review. 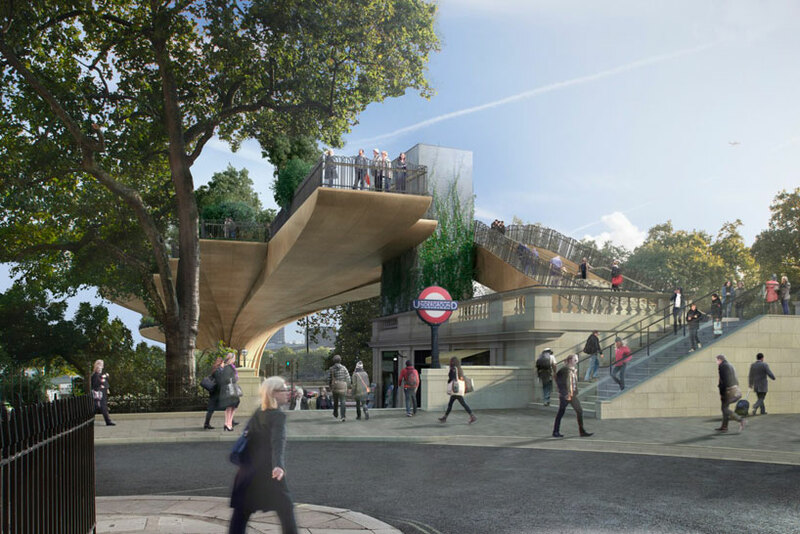 concerns emerged that an enabling project at temple tube station could lead to more public money being spent on the £175 million project ($225 million USD). see more images of the proposed scheme below. 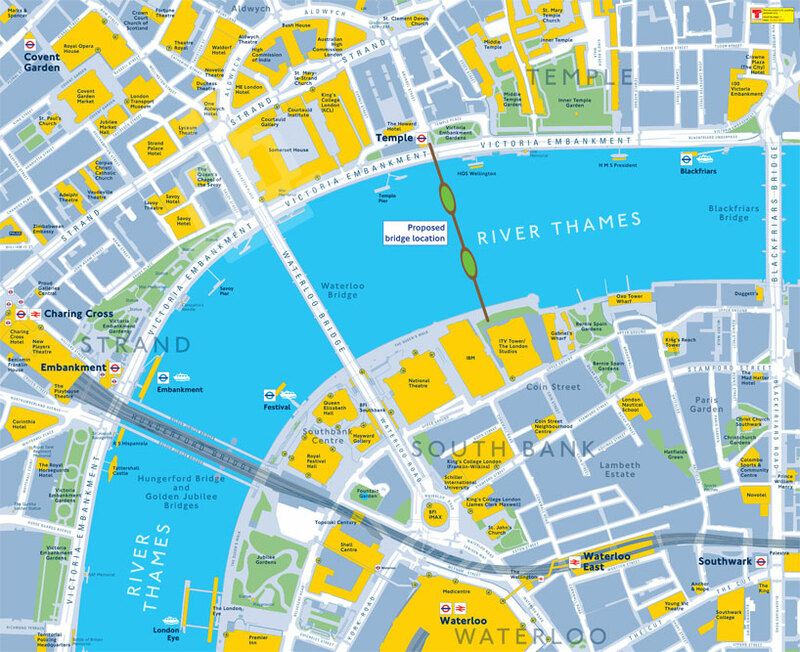 in 2013, transport for london (TfL) called for proposals that aimed at improving pedestrian links across the river thames. 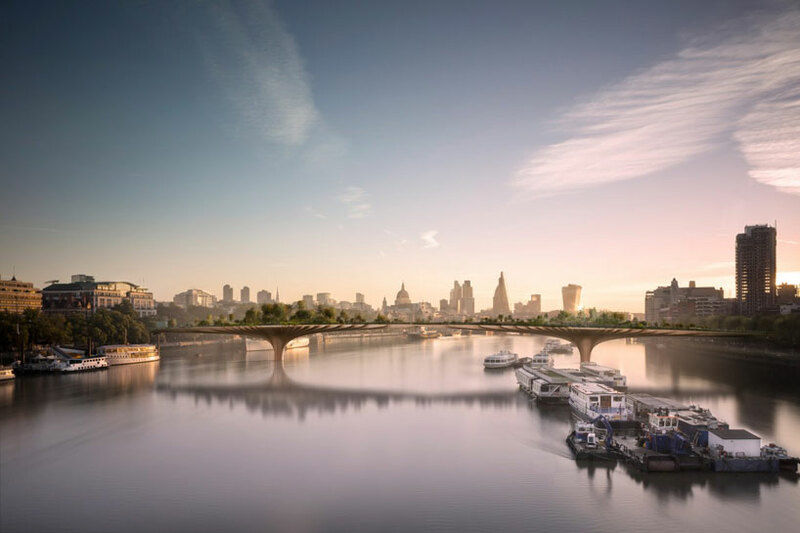 in response, architect thomas heatherwick, together with actor and green activist joanna lumley have conceived what they call the ‘garden bridge’; a scheme that sees a lush green space connecting north and south london — see desingboom’s initial coverage of their design here. over the past two decades, the british capital has seen its south bank transform into a cultural hub of art galleries, music halls, outdoor entertainment venues, restaurants and theaters, however the opposite side of the river–where the somerset house, temple district and waterloo bridge can be found–is far less frequented. heatherwick and lumley have developed a strategy that links these two zones via a structure that widens and narrows across its span–an elevated garden that will offer locals, as well as visitors, a place in which to enjoy unparalleled views of the city, while providing new walking routes between the popular covent garden and soho quarters. it will also enhance london’s already rich and diverse horticultural heritage of allotments and community gardens, heathlands, parks and squares; further fulfilling its reputation for being one of the greenest urban areas of its size in the world. on november 1st, the newly appointed garden bridge trust fund initiated public consultation of the venture that will run until december 20th, 2013. heatherwick and lumley are working closely with ARUP and the TrL on the programs of the bridge, and comments and suggestions collected over the course of the next month, including issues related to landscaping, materials and function, will inform their proposition for the project before planning approval in the first quarter of 2014.
construction on the ‘garden bridge’ is expected to begin in 2014, with completion projected for the end of 2017.
update november 10, 2014: thomas heatherwick’s design for ‘garden bridge’ is set to be granted planning permission by local authorities. 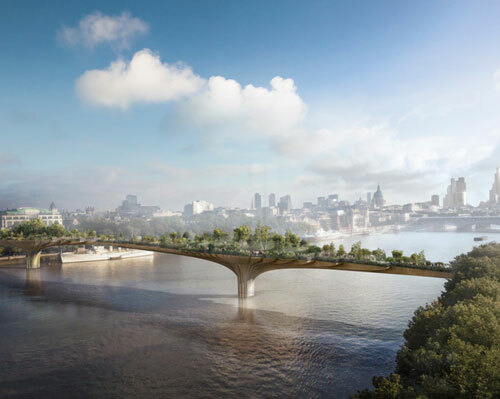 construction on the project, which spans the river thames between temple and south bank, could begin in december 2015 subject to funding. update, march 11, 2014: thomas heatherwick spoke at the 2014 design indaba conference, where he presented his firm’s ‘garden bridge’ concept for the thames, and revealed plans to redevelop cape town’s historical grain silo complex into a museum of contemporary african art (MoCAA). read more about the zeitz MoCAA on designboom here. This is an example of a project which has no real purpose. What are those two white things which cross The Thames on the map within a few hundred yards of the proposed bridge’s location? Well, I’ll be blowed – they are bridges! Beautiful concept, marries engineering and nature, creates terrain. The organic shapes are harmonious with the water and the play of light. Calatrava bones but with some biomeat on them for a welcome change. But that railing? Hideous afterthought! No relationship with the rest of the design. Get rid of it. Framless glass panels. A minimal little chrome rail if you have to. Just my two pence worth. Very nice idea to use circulation space as green space. However, I don’t understand how this is proposing to provide “new walking routes between the popular covent garden and soho quarters” – those areas are both on the same side of the river… am I missing something? ‘Beautiful’ is becoming increasingly relative & as common as ‘nice’. As originality goes, this is just another dull & dim variation: while OMA’s bridge proposal for public spaces & events has potential urban synergy & poetry. By now most architect-readers would strongly suspect that this is yet again another PR-marketing exercise for attention seeking or maintenance. Why no mention of Dan Pearson Studio’s involvement as Landscape designer?